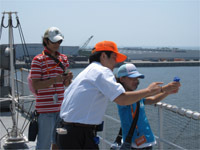 SHIRASE Sails to Support Revitalization of Port of Onahama in Fukushima – Weathernews Inc. Retired polar observation vessel sails again to support earthquake and tsunami victims. Weathernews Inc. (Head Office: Minato Ward Tokyo. 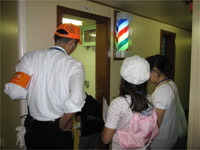 CEO: Chihito Kusabiraki) will host a festive event from Friday, July 8th at the port of Onahama in Iwaki City (Fukushima Prefecture) onboard the retired ice-breaker, SHIRASE. The former polar observation vessel will be anchored at the port of Onahama for one week, during which the general public will be given a chance to tour the ship and participate in an open-discussion on Tsunami Disaster Mitigation and other fun activities. While raising the spirits of the local residents, Weathernews will also install radar and weather sensors for detecting tsunami to support the safety of recovery and revitalization efforts in the disaster area. After the Great East Japan Earthquake, difficult conditions in damaged areas continue largely unchanged. Immediately following the disaster, Weathernews launched a dedicated site for disaster information, and install compact radar and other sensory equipment for the purpose of providing support and aid to the recovery and revitalization efforts in the disaster areas. However, we continue to think about what we can do NOW to support the people in areas affected by the disaster on a continuous basis. Here on this occasion, we will make an effort to boost revitalization efforts of local coastal industries for the people Fukushima. A key distribution center for the recovery efforts, the port of Onahama also has special symbolic significance for Weathernews in memory of late-founder Hiro Ishibashi’s mission to protect the lives of sailors from dangerous maritime weather conditions. Last May, the re-born SHIRASE set sail on her second voyage as a symbol of ecological initiatives of Weathernews together with partners and Supporters. At her next port-of-call at Onahama from July 8-13, the SHIRASE will be the stage for various displays of support and aid for the recovery and revitalization efforts. These efforts will be given a big boost thanks to the cooperation of Iwaki City, local sightseeing groups, and Weathernews Supporters (mobile subscribers). During this week, compact radar and other weather sensors will be installed around the port to detect tsunami and typhoons in order to reduce the risk to coastal communities for the purpose of supporting smooth and safe recovery and revitalization efforts in Iwaki City and the port of Onahama. The new sensory infrastructure will include Weathernews' compact and innovative WITH Radar which is capable of detecting suddenly occurring weather phenomenon. 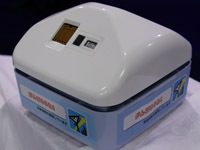 A variant of this compact radar called, Tsunami Radar is currently under development. As the name implies, Tsunami Radar will be specialized for detecting tsunami, and is expected to begin data transmission later this year. To further enlist the support and sympathy of people for conditions in the disaster areas, Weathernews will cover the events on the SHIRASE with special content and programming through our smartphone/mobile applications, internet and cable/satellite TV broadcasts. *In the event of unforeseen weather conditions or events which present a danger to visitors boarding the SHIRASE, the event may be cancelled for the safety of all participants. The SHIRASE will be accessible for viewing by the general public. The tour will show her history as polar research vessel, and current mission monitoring natural phenomenon. The Sorayomi Dojo will offer training to spot changes in cloud formations, and measure changes in temperature and other sensations from the deck of the SHIRASE. 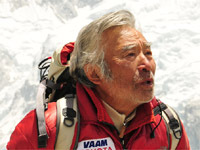 First Officer of the SHIRASE, Yoichiro Miura, is also the oldest man to ever climb Mount Everest at age 75. 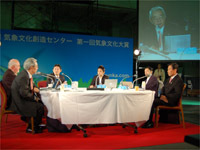 Mr. Miura will speak about revitalization of damaged areas. Professor Fumihiko Imamura of the Tohoku University Disaster Control Research Center will lead a discussion on tsunami disaster information and countermeasures. To boost reconstruction and revitalization efforts in Fukushima, there will be an open discussion with local fishermen, farmers and tourists. Thanks to the cooperation of Gurunavi Inc. and the Coca Restaurant Chain, food will be prepared and distributed at the SHIRASE March. Courtesy of Sanrio Inc., Hello Kitty will make an appearance at the event to sing and dance to raise spirits and hopes of children in Fukushima prefecture. Local residents of all ages can enjoy special hula dance show hosted by a local hula dance school. There will also be a special performance by children. Weathernews is developing an early detection and warning system for tsunami, dubbed Tsunami Radar, to be installed at various locations in Iwaki City. 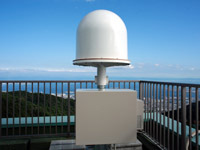 Weathernews will install compact Doppler radar around Iwaki city to protect local residents from thunderstorms and tornados with our expanded WITH radar network. Compact sensors for measuring sunlight, humidity, UV and other weather elements will be installed in the area. Highly detailed data from these sensors will be used for forecasting. In cooperation with local fishermen and Tokai University, Weathernews will monitor sea temperature, salinity and radioactivity for the safe reconstruction of local coastal industries. 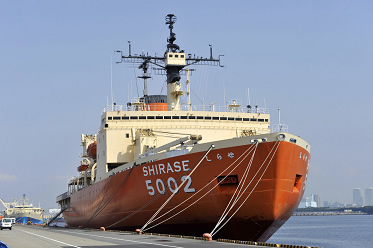 Starting with the discovery of the ozone hole over the Antarctic, the SHIRASE has made many contributions to science through environmental data over her 25 year history as a polar exploration and observation vessel. Last May, the SHIRASE was opened to the public, reborn as a symbol of ecological initiative and venue for environmentally themed symposiums and events year round, receiving over 10,000 visitors each year sharing thoughts and spreading knowledge. In addition to preserving this national asset for display, Weathernews is continuing her mission to monitor and report on the state of the North Pole for those concerned with the effects of global climate change.